Sassy salon owner Marla Shore is giving grumpy Mrs. Kravitz a perm when her client dies in the shampoo chair. If that isn’t enough to give her a bad hair day, handsome Detective Vail suspects Marla of poisoning the woman’s coffee creamer. Figuring she’d better expose the real killer before the next victim frizzes out, Marla sets on the trail of a wave of wacky suspects. Her theory regarding whodunit gels only after she looks for the culprit closer to home. “A terrific mystery debut for Nancy Cohen. 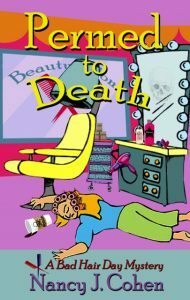 Marla the beautician is a delight!”—Tamar Myers, author of the Pennsylvania Dutch Mysteries. I was getting a perm, waiting for my timer to go off and watching the other customers staring into space. I thought, we need something gripping to read to kill time. Why not kill off one of these ladies? A hair salon seemed like the perfect backdrop for a mystery series. And so was born hairstylist and salon owner Marla Shore. In Permed to Death, she's giving her crabby client a perm when the woman dies in the shampoo chair. Handsome Detective Vail suspects Marla of poisoning the woman's coffee creamer. A hairstylist is in a great position of overhear conversations. People confide in their hairdressers, and it can be a mobile profession such as when a stylist does a wedding party. So Marla the hairdresser is my sleuth. In the first book, she's interviewed by Detective Dalton Vail who becomes her love interest throughout the series. Other characters include Marla's relatives, friends, and business associates. “You made a fresh pot of coffee just before Mrs. Kravitz came in?” Detective Vail asked, ripping her away from painful memories.